Many of us remember the day we heard that Sonny Bono, a California congressman and half of the singing duo Sonny and Cher, had died while on a ski trip with his family in Lake Tahoe, Calif.
Bono was no amateur when it came to skiing. In fact, CNN quoted a family spokesperson as saying Bono was a “very proficient skier” and an “athletic guy.” He had been skiing on those same slopes for more than 20 years. Media reports said that Bono was skiing alone when he slammed into a tree at a high rate of speed. The New York Daily News reported he skied off the main trail and was likely weaving in and out of trees in fresh powder when he was killed. Skiers and snowboarders, no matter how experienced, should never ski alone. Nor should they ski off the designated trails. Experts believe Bono was killed on impact, but in many cases an injured skier could be saved if someone is there to help. According to the National Ski Areas Association, while “less dangerous than other high-energy participation sports,” about 42 people die and about 45 people are seriously injured each year skiing and snowboarding. Excess speed, loss of control and collisions with stationary objects, like a tree or lift tower, are the most common factors associated with fatalities. The National Safety Council advises all skiers and snowboarders to take the time to review proper skills and safety techniques. Get in shape for the season, and not just the week before a ski trip; a regular exercise routine will help reduce fatigue and injury. Always know the weather conditions before heading to the slopes; time of day can also affect visibility and make obstacles difficult to see. Give skiers in front of you the right of way; they most likely can’t see you. If you must stop, stop on the side of a run, not in the middle. Look both ways and uphill before crossing a trail, merging or starting down a hill. Use skis with brakes or a snowboard with a leash to prevent runaway equipment. Never ski on closed runs or out of boundaries because these areas are not monitored and there is no way to know what the snow conditions are; a rogue skier could even cause an avalanche. Helmets reduce head injuries between 30% and 50%. However, even though helmet use has increased over the years, traumatic brain injuries still can occur, even with a helmet being used. Severe injury and death are best prevented by avoiding risk-taking behaviors. Skiers and snowboarders also should select quality equipment. Improperly fitted or misadjusted gear can cause injury, so it’s best to ask for expert advice when purchasing and fitting boots, bindings and skis. 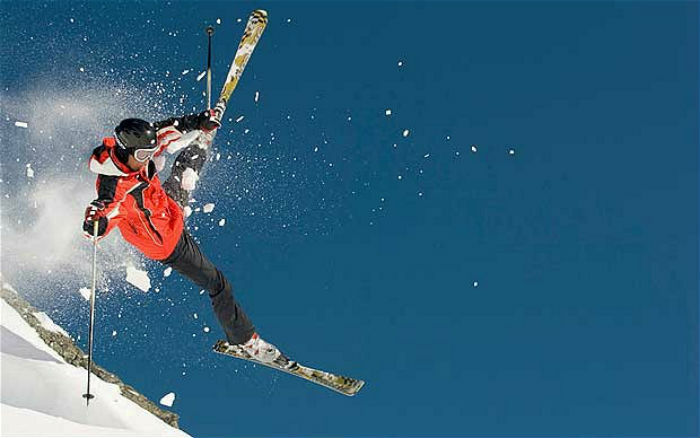 While trendy ski apparel may look good on the slopes, clothing should be functional. Wear bright colors, dress in layers and make sure outerwear is made of fabric that is not only water repellent, but slide-resistant. Following these basic safety tips will go a long way toward ensuring that next powder run isn’t your last.